I am currently working with b-side to provide Creative Producer support to 6 new art commissions for a public art trail in Weymouth town centre. The commissions are for Weymouth & Portland Borough Council. They include the potential to create work in association with water refill units – to our knowledge the first time public art has embraced promoting the use of units, as a trail, to reduce single-use plastics. Wessex Water are supporting the project. Full details about the commissions and to apply, visit Curator Space. Creative Canopy goes wild in the country! What a brilliant day we had yesterday here in the Forest of Dean! We were at the West Dean Parish Council building in Bream to launch Creative Canopy and it was packed to the hilt! The perfect sunny day, we were able to spread the activities into the wonderful courtyard garden. Being part of the BBC Get Creative Weekend was great too. There’ll be a press release going out very soon, but meanwhile, here’s a video link so you can enjoy a bit of what we had – though it won’t be as good as being there! And a few pics too. I’m delighted to hear that Arts Council England and The Forestry Commission have signed an MOU to work together to support contemporary arts in woodland areas. Some of you may be aware I worked for the Forest of Dean Sculpture Trust for several years as their Project Director – I enjoyed every minute of it. At the time, whilst there were already many art projects hosted on Forestry Commission land, they weren’t particularly regarded as an important part of the FC offer. Don’t get me wrong, FC were incredibly supportive, but their visitor surveys didn’t even ask about whether or not people came to see the art at their sites. But that’s all changed now. The appointment of Hayley Skipper up at Grizedale a few years ago marked a wind-change for FC and their relationship with art. Since then, Hayley has worked very effectively towards this moment, which is very exciting to see. Excellent leadership and patience has paid off. And Cathy Mager on a local level is doing some great work too. This MOU is a turning point for arts in the Forest of Dean too. I’ve blogged before about how things are happening here – Blackrock last year; new works on the Sculpture Trail; a selected show for Forest of Dean and Valleys Open Studios group; and artists migrating to live here. New groups are forming too, Forest Arts Action Group, around the Postcard Exhibitions which fundraise for refugee projects. ARE THE NATURAL RESOURCES OF THE AREA MERELY A COMMODITY? PRIVATE VIEW & LAUNCH OF OPEN STUDIOS: 6-9PM ON FRIDAY 8TH JULY AT THE GARDEN CAFE, (Facebook), LOWER LYDBROOK, FOREST OF DEAN, GLOUCESTERSHIRE. Congratulations to all the artists selected for this years special exhibition. Each artist will be awarded a sum of £100 to thank them for their participation. This year is the first time FandVOS has hosted a special exhibition curated by a guest curatorial team, led by myself and supported by Keith Baugh, Adam Cairn and Carina Greenwood. Developing the Commodity exhibition with the artists has been an absolute pleasure. A great thing about forests and valley landscapes is they offer wonderful hidey-holes for creative people to live and work in. Artists and writers have celebrated this place for centuries through their creativity and have gained quite a reputation for doing so. It is fitting to exhibit these ‘Commodity’ artworks in the Garden Café. What is now a tranquil homestead, tucked into a hill near the River Wye, was once a thriving industrial area. With wire factories across the road and a viaduct that actually ran over the house! If you want to know more chat to Paul Hayes, the owner of the Garden Café – he has many stories to tell and is a fantastic host. The works have been selected to provide an entry point into an enquiry about the Forest and Wye Valleys specifically in terms of ‘Commodity’. They are not commissions – FandVos does not yet have the financial means to commission new work, but they hope in the future that will change. Some of the artists have, however, created new works for this show, motivated by the opportunity to stretch their practice, which is fantastic. I mention the hidey-holes above, because as someone who moved to this area ten years ago, I am constantly amazed by the number of new artists I encounter who are working the area. And it’s great to see young artists moving here too, adding to the mix. Living here is very special. Some local artists work in far-flung places, while others choose to work primarily in this area. It’s a privilege to see the range of work made here and exciting to install it in such a beautiful building and garden. Novvy is showing three prints, unframed, that respond to three natural materials found in the area – water, wood and wool. She is also showing some associated materials, including a piece of knitting made with wool dyed with local natural resources, which was used to create the Wool print. The print of the putchers is concerned with the traditional method of salmon fishing used in the River Severn but now in sad decline. The wood represents the wrangling and landownership battles that have gone on forever in the Forest of Dean, and continue to this day. Lizzie’s work is made with textiles dyed from local materials and stitched tenderly by hand. Each thread has its own colour nuances that when overlaid across the other pieces of fabric create a sense of rhythm through the work. Lizzie walks the forest and the riversides constantly, meditating on the land, praying for its safekeeping. Fracking threatens to fracture this landscape beyond redemption. This work is a meditation on that fear. Tom is a political activist and a muralist and the work shown here is a very clever way of marketing both of those things. It raises our awareness, through wit and humour, about the concerns communities have about fracking. The twist is, of course, that Tom can earn his living from these political issues, at the same time as making sure that his own concerns by others, who amplify their worries by shouting them out loud on their house walls. He does this work exceedingly well and his film plays on the irony of that. Do take a leaflet if you want to be heard. Rob is a sculptor renowned for public art work, which he has been delivering widely for many years. The acoustic mirrors and their associated narratives have been a focus for him for some five years. Big, bold and colourful, they draw the viewer towards them so the more subtle nuances can be enjoyed. Only when close up can you hear the sounds emanating from them and listen to the soundscape. They create a place within a space, bright and calling with a reward at the end – like being drawn towards a rose and bending down to smell it. Kathy’s 3 Hunting Pots were especially inspired by ‘Commodity’ and represent different animals traditionally hunted in the Forest, always a source of food for foresters. Commoners’ rights for grazing were often high on the local agenda, and hunting with dogs represents both nature and the rural culture of Foresters’ resistance to the power of an overlord. The pots are richly glazed with local clay slips and iron ochres from Clearwell Caves; wax resist between the slip and the glaze reveals the original clay, which spontaneously interacts with the glaze to give both earthy and vivid colours. Her usual pots are more functional, made to be used. Utilising Clearwell Caves ochres as pastels, Cinderford Stream uses a similar palette, harmonising with her pots, and revealing her love of complementary colours as found in Nature. Claire is a landscape painter and has shown work in several exhibitions that explore themes of environment and conservation, exhibiting with organisations such as the World Wildlife Fund and Raleigh International, at venues as diverse as car show rooms, London Zoo, ecology centres and hospitals. For this show she has chosen to further explore her methods of making work that can be shown outside, in the place that inspires it. Using robust materials means that she has to make very clear marks, as opposed to the subtler ones she can achieve in watercolours. These works have a very physical existence and straddle the worlds of painting and sculpture. Sally makes very beautiful paintings that often celebrate flowers and landscapes in a dreamlike way. At first sight, you may consider these works to be doing just that, but they were informed not so much by a celebration of place but as a sadness that an area of land near Cinderford, called the Northern Quarter is to be developed – putting all of the plants and wildlife at risk. In the Northern Quarter of The Forest of Dean the land is to be scraped off and reused. This work is a fleeting record of a brief moment in its long history. Made when it was a liminal place recovering from industrialisation; the haunt of dog walkers and anglers. A place in the process of rewilding. Once again the land is being pressed into service of man. This is my fragile record of an alternative. Sally collected leaves, water and found iron from the site, eco printed the leaves onto paper and coated the results in beeswax. Frances comes from a history of working in the social housing sector and now creates art (which she finds hard to name as such) from found materials and upcycled waste. She paints, nails and ties these things together to create fascinating structures which welcome insects and other creatures to dwell in them. She paints them with colours which attract insects and the frames are not dissimilar to those Mondrian created in his later works. They provide miniature ecosystems that have been created from the rubbish that ruins our landscape we claim to love. The Burton Art Gallery & Museum began the commissioning process for the Bideford Black: Next Generation show in 2014, when we – Carolyn Black of Flow Contemporary Arts and independent arts consultant Claire Gulliver – were appointed to project manage the process. Between the selection of the artists in the autumn of 2014 and the launch on Saturday 3rd October, the journey has been both fascinating and intriguing, with all of the team taking on their roles with gusto and passion. 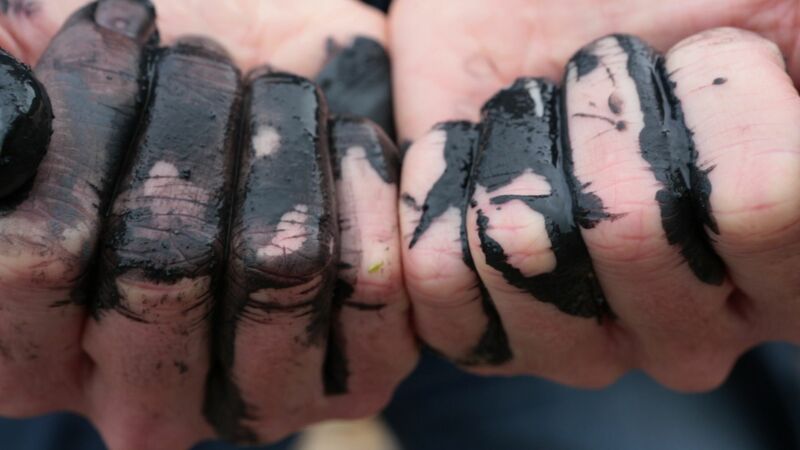 The brief given to the artists was to make new works for the collection and develop ways of using Bideford Black as a medium or an inspiration – an expanded field of this black earth pigment. The film maker was tasked with documenting the project process and outcomes. This project was not the first, and will not be the last, to have Bideford Black at it’s heart. The commissioning process was new to the Burton Gallery – never before had they commissioned contemporary art from scratch – so we were all aware there would be challenges along the way. And there were, starting with the huge response to our call for applications, with over 165 expressions of interest for only 8 artist commissions and one film maker contract. It was a hard decision to make but the selected artists are: Tabatha Andrews, ATOI, Luce Choules, Corinne Felgate, Neville and Joan Gabie in collaboration with Dr. Ian Cook, Littlewhitehead, Lizzie Ridout, Sam Treadaway and Liberty Smith. And what they have produced is like a 360 degree survey of the pigment and its history. As more and more museums begin the process of commissioning contemporary art, sometimes for the very first time in their history, the learning curve is sometimes a bit twisty and wobbly. There is still much work to be done in creating a model for good practice so sharing the process is a useful thing to do. It’s not easy for organisations that have historically been guardians of wonderful things that are in their possession, to also consider commissioning new items for their archives that will continue the cycle of making and collecting. New becomes old, past becomes present and indeed future. Acorns –> oak trees. As the only purpose-built venue in the area, on the north coast between Bristol and St Ives, the Burton is an accredited museum and art gallery, making it a leading cultural venue in SW England. It collects, safeguards and displays artefacts of cultural, historical and industrial significance, in particular related to the North Devon area and Bideford specifically. It also initiates and brings exhibitions and artists of national and international standing to the region, working with national institutions including Tate, The Royal Academy, Victoria & Albert Museum (V&A), The Barbican, alongside community or heritage focus exhibitions. And it now commissions new work too. So the research process began a year ago, with a getting-to-know everyone session. With most of the artists in attendance, alongside other interested parties – notably the National Trust and Ian Cook, a cultural geographer from Exeter University – we shared our own histories and interests. A field trip to the beach where the pigment is found was the introduction to both the material and to each other. Stomping along cliff paths, wobbling along rocky beaches in wellies, grinding sticky black stuff between our fingertips, we were a picture to behold! Few left the beach without black smudges on their face, as they wiped their hair from their faces in the wild wind and salty spume. So, to keep Bideford Black, this rich black earth pigment, at the centre of this narrative, what happened over the coming months was that each of the artists entered their own private explorations. Like the miners that went before them, they manipulated the clay, mixed it with others things, sniffed it, cast it, crushed it and even listened to it. Some locked themselves in their studios to grind and mould it, others returned again and again to the beach or to the museum while they tried to find their own relationship with the black clay through time and place. During that time Liberty Smith, the film maker, was despatched around the country to film them. She documented their early enquiries, listened to their stories of excitement and joy, fascination and frustration. Liberty was tenacious; she even travelled to Scotland, France and Spain to conduct her filming. Her footage, as rushes were shared, were clearly going to be an important part of the process. Indeed they were so wonderful we asked Liberty to create a trailer for the main exhibition and film, which you can see here – it is beautifully filmed, capturing the research far better than words could ever do. At the time of writing, she is editing the final film, which will share the entire journey with audiences and be shown in the gallery when it opens at 2pm on 3rd October 2015. From the rushes I’ve seen to date, the film gives visitors privileged access to the artists studios and thought processes – a very valuable document for the archive. Whilst Liberty caught developments on film, Claire, me and the gallery curator Warren Collum, had conversations and made notes. Due to the dispersed nature of the artists geographically, updates were often by phone, email or Skype. We had staged reviews, to make sure the artists had what they needed from the right people. The comments below were in response to the question “how will this [your work] relate to Bideford Black?” I’ve blocked them together, because as a whole they feel like an image of the pigment – considered from every perspective, touched in every way possible. It’s about transformation of material from one thing to another. The fighters [represent] tectonic plates grinding and marking. Locating the production of the work at Bucks Mills will transform the fabrication into a live event….become where a myriad of personal and collective histories are collaged over one another….drawing on the cabin as a site of both industrial and artistic production as well as a place of retreat. Drawing on the decline and resurrection of Bideford Black mining twice over the 20th century, the factory imagines a third and final revival of the industry that never was, as well as focusing on individual endeavours to work with Bideford black, outside of the mainstream industry like Mr G Philips’ Bideford soaps produced in his home laboratory, that reeked of carbolic in addition to using it to make all of his paint. BB will be the main material in the work. Words and texts will relate to it; ink will employ BB; Vanta could make comparisons to BB. We also discussed the possibility of a thesaurus of BB. It’s about dynamic movement. BB will always be the material and the concept at the centre. The scent itself will be created from the genus of Tree Fern most closely related to those existing in the South West of England 300 – 350 million years ago. The scent therefore references the origins of the mineral black material. Made with BB pastels, smeared onto paper, about immersion in dark places, how light is taken away, darkness and its emotional implications. We have pushed the past uses of BB in industry and warfare, the connotations of mining and all its associations, and we have also taken into account the geological and physical properties that were endured to create BB….we have brought the pigment into the future by playing on its raw associations of mined materials, by creating a polished finished product [a diamond]. We have employed the most advanced modern day technologies which nod to its history and the politics and poetics of working with this material. The ceramic slabs appear almost fossil like, becoming relics of Bideford Blacks Jurassic-esque history when it was mined out of the grounds as the mascara rods highlight our disconnect from this in contemporary society. The mascara rods also have the initial appearance of tools used in early industry, paying homage to the miners and other industrial workers who worked in and around Bideford. Developing on from the mines, the Bidi Black make-up range draws on its history for commercial production and the swathes of industry and commodities that have come out of Bideford over the last millenuia, notably the cosmetics of Max Factor who adopted the pigment. We have used BB to try and tell its own story, by creating audio tracks. Black is inherent in the social, economic and cultural narrative of Bideford through the town’s connection with Bideford Black. A Polychromy in Black seeks to examine Bideford Black through an investigation into light, dark and colour via the use of tone and texture in archival material gathered in The Burton Art Gallery & Museum. It also cross-references Bideford Black within the broader cultural story of black by considering specifically ink and printing press production and the role of the engraver. It was the engraver’s role to translate colour, form, chiaroscuro and texture from real-life or paintings, through the use of line, cross-hatch and dot; regular/irregular, thick/thin, curved/straight, continuous/discontinuous, vertical/horizontal/diagonal, in multiple as bunches or alone. Based on an ongoing dialogue between artists and a geographer, we present parallel approaches to one material, based on our shared conversations, but with differing outcomes. Exploring the possibilities of the substance that is affectionately known as Biddiblack we are making a series of drawings and films to explore its nature – its unpredictabilitys – its uses and performance as a drawing tool. The dialogue will be central to the final outcome of the work. The artwork reinterprets Bideford Black via the medium of smell. Through its presentation the work also references the historical commodification of the Bideford Black material (and commodification, commercialisation and transportation of generic raw materials in general) with a contemporary twist. These works reverse western traditional representation – rather than being looked at, they come out at you, are looking at you, sensing you. It’s about experiencing in situ. BB looking at you. But is this art? And which representation of the chair is most “accurate”? 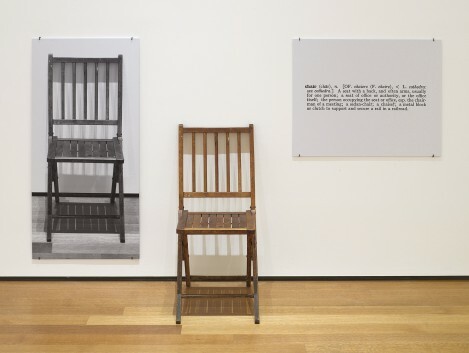 These open-ended questions are exactly what Kosuth wanted us to think about when he said that “art is making meaning.” By assembling these three alternative representations, Kosuth turns a simple wooden chair into an object of debate and even consternation, a platform for exploring new meanings. Kosuth reminds us that art, photographs and texts are not the ‘real’ thing, they are alternative representations. I interpret that the ‘one’ chair he refers to as the one I have in my mind – but maybe he is referring to the thing itself. No matter, it is the fact that these works evoke debate and offer a platform for exploring new meanings that is the imperative. Monday – Saturday, 10am – 4pm.